Earlier this year one of the most accomplished motocross rider in the world, Ryan Dungey, shocked the world by announcing his retirement in the peak of his career. Although the seven-time AMA champion walked away from competing, that doesn’t mean he’s going out quietly. In a testament to the industriousness of the community and driven disposition of those from the American Midwest, Dungey delivers “Homegrown”, the definitive statement to his career that reflects his personal mantra of believing in commitment, hard work, and sacrifice. The video captures the Minnesota native as he showcases his incredibly fast riding in a one-of-a-kind 10-acre cornfield-turned-motocross track with the same mentality he was raised on – put in the work, see results. While the track itself may bewilder some, it symbolizes the region that Ryan calls home and the effort that was put into his career. From humble beginnings, but from a family of dedicated and passionate motorsports enthusiasts, this “simple” Minnesota boy went on to rise to the top of his sport, achieving 80 total wins, 12 Championships and winning ESPY’s for Best Male Action Sports Athlete in both 2015 and 2016. Despite his accomplishments, Dungey has managed to stay grounded and become an icon to the sport, never forgetting where he came from. As with agriculture and the spirit in which America was built, Dungey’s “Homegrown” represents solid core values and commitment to a cause. Join us as we celebrate the motocross superstar’s last rip around the track and experience first-hand the adrenaline, the fuel, and the lifelong pursuit of greatness. The 2017 FIM Awards took place this past weekend in Andorra. Andorra is a principality, located in the mountains between France and Spain. Below is the text and image directly from the FIM. The Long Haul category was all about endurance and saw Chile’s Pablo Quintanilla pick up the FIM Cross-Country Rallies World Champion for a second year in a row. Russia was well represented in the Ice to Asphalt category with Dmitry Koltakov being declared the 2017 FIM Ice Speedway Gladiators World Champion. The Stepping Stones category included those champions who have made important strides in their sporting success, and this was illustrated by Josep Garcia who received his medal for becoming 2017 FIM Enduro2 World Champion. Finally it was the Elite category, which brought the highly applauded ceremony to a close. The female side of the sport featured strongly in this category with 2017 FIM Women’s TrialGP World Champion Emma Bristow and 2017 FIM Women’s Motocross World Champion, Kiara Fontanesi picking up their medals together with 2017 FIM MXGP Motocross World Champion, Antonio Cairoli, 2017 FIM Speedway Grand Prix World Champion, Jason Doyle, 2017 FIM Superbike World Champion, Jonathan Rea and 2017 FIM MotoGP World Champion, Marc Marquez. It's Issue 168 of the World Renowned On Track Off Road Magazine - read it here! One hundred and sixty-seventh issue of this re-designed bi-weekly motorcycle sport magazine, tackling the latest races and issues in MotoGP, MXGP, AMA Motocross / Supercross and World Superbike as well as general motorcycling and accessories with the best blogs and photographs. In OTOR 167: Boxed-in, set free: Barcia; exclusive talk with one of the real characters of motocross – Justin Barcia – as the American negotiates a bumpy crossroads and the next steps in his career. Best of Ernie: WorldSBK; Steve English chats with one of Ducati’s technical legends in the sport and a career that involves a spectrum of outstanding talent. The cost of it all: MotoGP; how much does MotoGP dent the wallet for a satellite team equipped with a factory bike? We asked Cal Crutchlow’s Crew Chief at LCR Honda to give us a price. Qatar closer: WorldSBK; Graeme Brown copes with the sleep-deprivation of the final round of WorldSBK at Losail for his last Blog from trackside and a Rea broadside in 2017. The 2018 Monster Energy Supercross season embarks on a new era with a revised points system, the addition of three Triple Crown Monster Energy Cup-style events, two 250 SX East / West Showdowns, four Supercross Amateur racing events and the elimination of semi races in qualifying for the Main Event. For the first time in over two decades, the 2018 season will debut an all-new points system to evenly allocate points over all 22 finishing positions. While the gap between 1st, 2nd and 3rd has not changed, the new points system will ensure that the race to the championship will be much more competitive throughout the season as the reward is greater for a better finish. The elimination of semi races will add further pressure to qualify - two chances to ensure a spot in the Main Event through one of two heat races or a last chance qualifier (LCQ). The Top 9 in each heat will qualify directly into the Main Event, while positions 10-20 will have one last chance to make it through the LCQ. Previously, only five positions would transfer to the Main Event from the heat races and all others would be transferred to a semi race. Eliminating the semi races will make for longer heat races and last chance qualifiers, allowing for more intense battles on the track from the stars for the fans. From a fan's perspective, the biggest change in 2018 will be the introduction of the Monster Energy Supercross Triple Crown, a three-city showdown hosted at Angel Stadium in Anaheim on January 20, Mercedes-Benz Stadium in Atlanta on March 3 and U.S. Bank Stadium in Minneapolis on April 14. Both the 250 SX and 450 SX Classes will compete in three Main Events! Qualifying races will deduce the field to the top 22 riders in each class, and the 250SX Class will compete in 6, 10 and 12 minute Main Events, while the 450 SX Class will compete in 8-, 12- and 15-minute Main Events. An Olympic-style scoring method will be used to determine an overall winner in each class from all three Main Events where the lowest combined score at the end will be awarded the overall win. Additionally, two 250 SX East/West Showdowns will double the excitement in Indianapolis and Las Vegas this season as fans will have the opportunity to see 20 of the fastest riders from each coast (Eastern Regional 250 SX Class Championship and Western Regional 250 SX Class Championship) battling each other for victory. The Main Event will be the first and only time throughout the night where all of the 250 SX Class stars will line up on the gate for a 15-minute plus 1 lap Main Event where winner takes all. Another change to the 2018 season includes the addition of four Supercross Amateur racing events at Angel Stadium in Anaheim on January 20, University of Phoenix Stadium in Glendale on January 27, Raymond James Stadium in Tampa on February 24 and Mercedes-Benz Stadium in Atlanta on March 3, which will give amateur athletes in 27 classes their only chance to compete in the same venue on the same weekend as all of the stars of Supercross. Along with format changes, every track in 2018 will have a distinct personality that tells the story of each city's Supercross history dating back over 43 years. Leave it to Red Bull. Not only do they have the very unique Red Bull Straight Rhythm happening this weekend at the Fairplex in Pomona, southern California, but they’ve added some special - The Two Stroke Shootout, hosting by Ken Roczen. Perhaps you’ve heard of Ken Roczen. Maybe. Possibly. Or perhaps you’ve heard of Ryan Villopoto (yes, he’s racing!). Maybe you’ve heard of Chad Reed? (Yes, Chad is racing on a two stroke too.) For sure you’ve heard of Ronnie Mac! Here’s the official info from Red Bull: The field is set for the Two-Stroke Shootout at Red Bull Straight Rhythm. 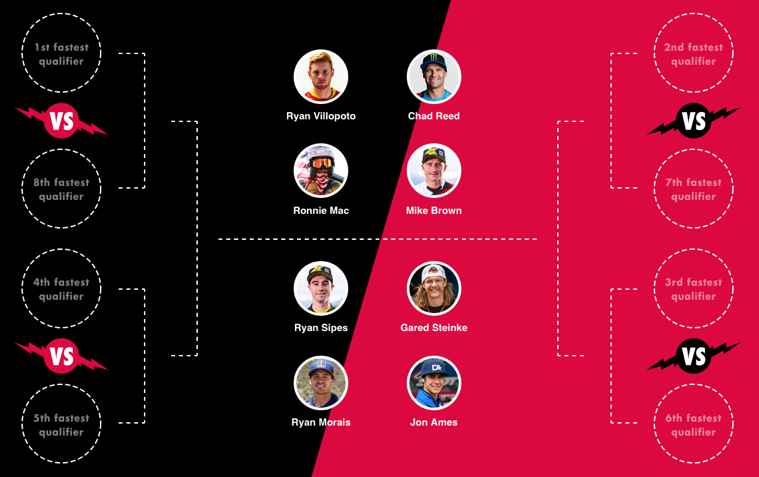 This eight-man bracketed competition will be exclusively for bikes with two-stroke engines, and will be hosted by Ken Roczen. But how will it all unfold? The Two-Stroke Bracket Challenge allows you to make your best guess. Drag and drop riders below to fill out your bracket and pick a winner. Submit your bracket and the first perfect bracket (or the closest to perfect) will win a prize pack from Fox Racing (not to mention the admiration of your friends and family). Get to Fairplex in Pomona or tune in to Red Bull TV on October 21 to root on your picks. MX Sports Pro Racing and NBC Sports announce the 2018 Lucas Oil Pro Motocross Championship schedule, sanctioned by AMA Pro Racing. The summer-long battle will once again consist of 12 rounds, beginning with the Hangtown Motocross Classic, the oldest race in American motocross, on May 19. Each stop of the championship will feature a pair of motos across the 450 Class and 250 Class, resulting in 24 grueling fights for victory in each division that will ultimately crown a pair of champions at season's end. The opening round from Hangtown, in the shadow of the California state capital of Sacramento, will celebrate its landmark 50th year in 2018 and will set the stage for a compelling summer of competition. The championship's 11 state journey spans from the forests of the Pacific Northwest to the shores of New England. At the center of the schedule is legendary RedBud, which represents the sport's annual Independence Day tradition and was just revealed as the host venue for the 2018 FIM Motocross of Nations. The summer will come to a dramatic conclusion at American motocross' newest track, Ironman Raceway, which continues its rise in popularity amongst riders and fans alike. The Lucas Oil Pro Motocross Championship has served as the preeminent competition in motocross since 1972, and remains arguably the most difficult championship to win in all of motorsports. Last season, Monster Energy Kawasaki's Eli Tomac broke through for his first 450 Class title, while Rockstar Energy Husqvarna Factory Racing's Zach Osborne parlayed a breakout season into his first championship in the 250 Class. At the season-concluding Motocross of Nations event, Broc Glover, Dunlop’s Senior Manager of Off-Road, was awarded the prestigious MXGP Lifetime Career Award in recognition of his contributions to motocross racing over the last 40 years. Among many racing accomplishments including being inducted to the AMA Hall of Fame and a Supercross Lifetime Achievement Award for amassing 50 AMA Motocross and Supercross wins prior to retiring in the late 1980s, Glover won six AMA National Motocross Championships, a record that stood for 20 years. The MXGP Lifetime Career Award recognizes Glover’s many U.S. and international accomplishments on and off the track, and for setting an example for the next generation of racers the world over. Glover currently spearheads Dunlop’s U.S. off-road racing program, and has been instrumental in its growth for the past 16 years. Feld Entertainment has announced the second season of the Supercross Video Pass will be available on September 1 and features significantly more Monster Energy Supercross content for fans outside of the U.S. and Canada, including an unprecedented amount of live and archived racing. In total, fans will have access to 240 hours of Supercross content that can be experienced on any type of connected device. Monster Energy AMA Supercross, an FIM World Championship, is the most competitive and high profile off-road motorcycle racing series in the world and attracts nearly one million fans in live attendance over the course of the 17-race season. Its digital fan base boasts an even more impressive number, engaging with 10 million weekly viewers from all over the world. "Supercross riders are some of the most elite athletes in the world. The excitement of motorcycle racing, the innovative track designs and the global representation of Supercross racers takes this sport beyond the borders of North America," said Vicki Silver, Chief Marketing Officer of Feld Entertainment. The Supercross Video Pass will provide access to all 17 rounds of the 3-hour Monster Energy Supercross television broadcast (2018), every race from the last three seasons (2015-2017), plus the 2015 and 2016 Monster Energy Cup races and an additional library of original content. According to research conducted by Hookit, the leading social and digital media measurement company, Supercross fans are among the most engaged consumers online, ranking the sport in the top-20 of global properties. The list includes the NBA, NFL, MLB, English Premier League Soccer, U.S. Soccer and the FIFA World Cup, impressively positioning Supercross higher than the ATP and PGA Tours. Silver continues "With two thirds of the Supercross fan base living outside of the U.S. and Canada, we are responding to the overwhelming international demand for live racing and behind-the-scenes content. Last season's video pass was purchased by fans in more than 100 countries and we anticipate a much higher response with this year's enhanced package." The Hookit research also shows that Supercross is the number one motor sport domestically and ranks in the top-10 of all U.S. and Canadian based teams and leagues, showing significantly stronger online engagement than powerhouse properties like NASCAR, MLS and the PGA Tour. For the study, more than seven million posts were analyzed across Facebook, Instagram and Twitter over a year period where views, shares, likes and comments were examined across 1,255 leagues, federations and teams internationally to determine who had the most engaged fan following. In addition to racing, this year's Supercross Video Pass offers three full seasons of Chasing The Dream, the acclaimed, behind-the-scenes documentary-styled series, plus two additional, full-length episodes that feature the "Legends of Supercross" for fans outside of the U.S. and Canada. Subscribers who purchase the 2018 Supercross Video Pass before October 14 will also receive access to the 2017 Monster Energy Cup. Single event passes will also be available for live and VoD access to any race, including the 2017 Monster Energy Cup taking place in Las Vegas on October 14, for $29.99. Access to video content will be provided through the mobile-responsive portal at supercrossLIVE.tv and via the Monster Energy Supercross Roku app. Direct from the AMA (American Motorcyclist Association) Three of America's fastest motocross racers will represent the United States at the 2017 Fédération Internationale de Motocylisme Motocross of Nations at Matterley Basin in Winchester, United Kingdom, on Oct. 1. For 2017, the U.S. Motocross of Nations Team includes Rockstar Energy Husqvarna's Zach Osborne and Thomas Covington, and Troy Lee Designs American Honda's Cole Seely. "This year's team is immensely talented," said AMA Director of Racing Kevin Crowther. "Zach, Cole and Thomas are accomplished riders, who have the aptitude and skill to capture the world championship. And they will, undoubtedly, give every ounce of effort to bring home gold." Seely will race in the MX1 class, bringing his experience from competing in professional Motocross and AMA Supercross events, including a second overall finish in 2014 in the 250SX West Coast Class of the AMA Supercross Series Championship and a third overall finish in 2015 in the 450SX Class. "I think it is important to have someone who is excited to be on the team," Seely said. "I'm stoked to make it this year and represent the country." Osborne, who will compete in the MX2, secured the 2017 250SX East Coast AMA Supercross Series Championship in May and currently leads the points standings for the 2017 Lucas Oil Pro Motocross series. "Being chosen to represent Team USA at the FIM Motocross of Nations has been a huge goal and dream of mine for a very long time," Osborn said. "I couldn't be happier to travel to the United Kingdom to race and ride my very best to bring the championship trophy back to the USA." After spending the past three years competing in the MXGP Series and winning the 2015 GP of Mexico, Covington will compete in the Open class. "I am truly honored to be picked for the United States' Motocross of Nations Team," Covington said. "I am really looking forward to getting to represent my home country overseas." AMA Motorcycle Hall of Fame Legend Roger DeCoster will once again manage the team as it seeks to secure the world championship. He currently manages the Red Bull/KTM AMA Motocross and Supercross teams and was a part of six victorious FIM Motocross of Nations teams in the 1960s and 1970s. "With Osborne it was obvious and he has been wanting to go [to Motocross of Nations] for years," DeCoster said. "Every year he has asked me, I have had to turn him down. This year he has earned it. Seely and Covington's results have picked up and I think it's a good time for them. All three riders really want to do it and their teams give them really good support." The U.S. team has won the Motocross of Nations 22 times, remaining the all-time leader in FIM Motocross of Nations overall team victories and claiming all of those wins under the direction of DeCoster. The last time the U.S. Team won the Motocross of Nations was 2011. The 2016 team placed third. The FIM has announced the projected schedule for the 2018 World Motocross Championships. 19 races. Two events (an MX GP and the Motocross of Nations) will be in the USA. There seems to be a problem for many on finding out how to view the 2017 Lucas Oil AMA Pro Motocross events via TV and online. This is the official information from MX Sports as to how to view the 2017 Lucas Oil AMA Pro Motocross Series. Qualifiers Online: 1 p.m. ET, ProMotocross.com and NBC Sports Gold app (LIVE & COMMERCIAL-FREE) Access the stream at ProMotocross.com and NBC Sports Gold app available on iOS, Android, Amazon Fire, Apple TV and Chromecast. Moto 1 Online: 4 p.m. ET, ProMotocross.com and NBC Sports Gold app (LIVE & COMMERCIAL-FREE) Access the stream at ProMotocross.com and NBC Sports Gold app available on iOS, Android, Amazon Fire, Apple TV and Chromecast. (LIVE) Once again this year, MAVTV will air first motos from all 12 rounds live. Use the MAVTV channel finder to see if you currently get MAVTV. You can also use that link to request that your cable provider carry MAVTV if they currently do not. Moto 2 Online: 6 p.m. ET, ProMotocross.com and NBC Sports Gold app (LIVE & COMMERCIAL-FREE) Access the stream at ProMotocross.com and NBC Sports Gold app available on iOS, Android, Amazon Fire, Apple TV and Chromecast. TV: 6 p.m. ET, NBCSN (LIVE) NBCSN will have live coverage of second motos in both classes this week. Use the NBCSN channel finder to see if you currently get NBCSN in your area. Red Bull KTM Factory Racing team rider Ryan Dungey has announced his retirement today from professional racing in a press conference hosted by KTM inside the iconic Angel Stadium in Anaheim, California. Dungey’s announcement comes shortly after securing his third-consecutive AMA 450 SX Championship aboard the KTM 450 SX-F FACTORY EDITION in what would ultimately serve as the final race of his professional career at Las Vegas’ Sam Boyd Stadium. Global World Motocross Supercross Championship starting in 2018? Un Championnat mondial pour Supercross et Motocross en 2018? Manufacturers, promoters, federations, teams, sponsors and riders unite to create true Global World Motocross Supercross Championship Series starting in 2018. DATELINE New York City, April 1, 2017: In a move sure to create a social media firestorm, leaders in off road motorcycling gathered in the media capital of the world today to announce a new ground breaking agreement for the 2018 season. There will be one unified Global Motocross & Supercross Championship. The name of the new series will be “The Monster Energy Lucas Oil Red Bull Global Motocross Supercross Series”. Representatives from leading manufacturers such as Honda, Yamaha, Kawasaki, Suzuki, KTM, Husqvarna, and TM, along with leaders of the largest promoting groups in the world, representatives for 156 National Motorcycling Federations, PR Hacks, and assorted tourists gathered here in New York City to sign and announce this new ground breaking agreement. • January 7 - Angel Stadium - Anaheim, Calif.
• January 21 - Angel Stadium - Anaheim, Calif.
• January 28 - University of Phoenix Stadium - Glendale, Ariz.
• February 4 - O.co Coliseum - Oakland, Calif.
• March 11 - Daytona International Speedway - Daytona Beach, Fla.
• April 29 - MetLife Stadium - East Rutherford, N.J.
At the conclusion of the series, an Awards Banquet will be held at the Champs Élysées in Paris, France, on September 20th to crown the 2018 Monster Energy Lucas Oil Red Bull Global Motocross Supercross Series Champion. Tickets will be available online later this summer. Reaction to this historic announcement was mixed across the globe. Ken Roczen, spotted in Florida at the time, was quoted after the announcement: Wow, das ist erstaunlich, ich kann es nicht glauben! Wie Ryan Dungey sagen würde: Ich bin super gepumpt! Es ist an der Zeit. In der Vergangenheit gab es viele Rennen und viele Serien. In den vergangenen Jahren gab es die 3 Hauptreihen, die separat laufen, was eine Schande ist. Jetzt, mit einer einheitlichen Serie, kann die Welt den besten Fahrer in der Welt kennen lernen. Eine Sache, die ich mir nicht sicher bin - 7 Rennen im April - wie wird das passieren? Oh ja. Ich habe vergessen. Es gibt diese Veranstaltung in den USA. Es heißt Aprilscherz. Hoffe es gefällt euch! Former World Motocross Champion, AMA Supercross Champion, and AMA Motocross Champion Jean-Michel Bayle from France had this to say as he boarded his flight at Tokyo's Haneda airport: J'adore April Fools Day! J'adore les croissants! Ken Roczen a dit que c'était April Fools, n'est-ce pas? Multi time AMA Supercross and Motocross Champion Bob Hannah said “Make sure to follow me on Facebook, Twitter, and Instagram! And about time they did this! Let’s see who really is the best in the world! Also, I hope to unseat FIM president Vito Ippolito Villopoto in 2018. High Key all the way! I want to run the FIM. I’m running on a platform of ‘More motorcycles for all’. My campaign slogan is Make Motorcycling Great Again! I’ll be posting on Insta and Snap from the Awards Banquet in Paris next year for sure!!!" 2006 FIM World MX2 Motocross Champion Christophe Pourcel said "Siri, quel est le meilleur dîner que je peux commander chez McDonald's? Que dois-je regarder sur NetFlix ce soir?" News from Google Japan - Google's new Keyless Keyboard called The Piro Piro. Watch their video to see what new technology is coming in the near future. DAYTONA BEACH, Fla. – Immediately following the 59th annual DAYTONA 500, the season-opening event to the Monster Energy NASCAR Cup Series race last Sunday, construction began in the tri-oval area between pit road and the start/finish line to create the grueling course for the Daytona Supercross By Honda, scheduled for Saturday night, March 11. For the 10th straight year, Supercross legend Ricky Carmichael returns as the course designer and Bomber Built, owned by three-time AMA 125cc National Motocross Champion Mark Barnett, is building the Supercross course. This year’s Ricky Carmichael Signature Design course sees the starting gate return to the east side of the tri-oval and competitors will race in a counterclockwise direction. A wide-open field of riders will compete for a coveted Daytona trophy, including Ryan Dungey, Cole Seely, Chad Reed, Eli Tomac and Marvin Musquin. Daytona International Speedway has been hosting the Daytona Supercross By Honda since 1971 and this marks the 26th year that Honda has sponsored the event. Among the Supercross greats that have captured the Daytona Supercross By Honda are Bob Hannah, Jeff Stanton, Jeremy McGrath and Carmichael. In addition, two crawlers, two front loaders, two bulldozers, two skid steers, one sheep’s foot, one roller, one grader and one water truck are used to move the dirt during construction. The Supercross Pits will be staged in the blue garages, which are located adjacent to the UNOH Fanzone and provide easy accessibility for the fans from noon to 6 p.m. – access is free with your race ticket. Also returning in 2017 will be the eighth annual Ricky Carmichael Amateur Supercross. Scheduled for Sunday, March 12 and Monday, March 13, amateur Supercross racers will have an opportunity to test their skills on the same course used in the Daytona Supercross By Honda. Following the Ricky Carmichael Amateur Supercross will be the third annual FLY Racing ATV Supercross on Tuesday, March 14. The re-branded American Flat Track Series will kick off its debut season with the DAYTONA TT on Thursday, March 16 and the .6-mile course has already been constructed underneath the Daytona Supercross By Honda course. Tickets for the event are now on sale at www.daytonainternationalspeedway.com or by calling 1-800-PITSHOP. General admission tickets for DAYTONA Supercross By Honda start at $45 and youth tickets (ages 6-12) start at $15; kids five and under are free in general admission stadium seating. Fans can stay up to speed on the latest news by using #DAYTONASX and #BikeWeek. Stay connected with Daytona International Speedway on Twitter, Facebook, Instagram, Pinterest, YouTube and Snapchat, and by downloading Daytona International Speedway’s mobile app, for the latest Speedway news throughout the season.